In the dream-time, a terrible drought swept across the land. The leaves of the trees turned brown and fell from the branches, the flowers drooped their heads and died, and the green grass withered as though the spirit from the barren mountain had breathed upon it with a breath of fire. When the hot wind blew, the dead reeds rattled in the river bed, and the burning sands shimmered like a silver lagoon. All the water had left the rippling creeks, and deep, still water holes. In the clear blue sky the sun was a mass of molten gold; the clouds no longer drifted across the hills, and the only darkness that fell across the land was the shadow of night and death. After many had died of thirst, all the animals in the land met together in a great council to discover the cause of the drought. They travelled many miles. Some came from the bush, and others from the distant mountains. The sea-birds left their homes in the cliffs where the white surf thundered, and flew without resting many days and nights. When they all arrived at the chosen meeting place in Central Australia, they discovered that a frog of enormous size had swallowed all the water in the land, and thus caused the drought. After much serious discussion, it was decided that the only way to obtain the water again was to make the frog laugh. The question now arose as to which animal should begin the performance, and, after a heated argument, the pride of place was given to the Kookaburra. The animals then formed themselves into a huge circle with the frog in the centre. Red kangaroos, grey wallaroos, rock and swamp wallabies, kangaroo rats, bandicoots, native bears and ring-tailed possums all sat together. The emu and the native companion forgot their quarrel and the bell bird his chimes. Even a butcher bird looked pleasantly at a brown snake, and the porcupine forgot to bristle. A truce had been called in the war of the bush. Now, the Kookaburra, seated himself on the limb of a tree, and, with a wicked twinkle in his eye, looked straight at the big, bloated frog, ruffled his brown feathers, and began to laugh. At first, he made a low gurgling sound deep in his throat, as though he was smiling to himself, but gradually he raised his voice and laughed louder and louder until the bush re-echoed with the sound of his merriment. The other animals looked on with very serious faces, but the frog gave no sign. He just blinked his eyes and looked as stupid as only a frog can look. The Kookaburra continued to laugh until he nearly choked and fell off the tree, but all without success. The next competitor was a frill-lizard. It extended the frill around its throat, and, puffing out its jaws, capered up and down. But there was no humor in the frog; he did not even look at the lizard, and laughter was out of the question. It was then suggested that the dancing of the native companion might tickle the fancy of the frog. So the native companion danced until she was tired, but all her graceful and grotesque figures failed to arouse the interest of the frog. The position was very serious, and the council of animals was at its wits' end for a reasonable suggestion. In their anxiety to solve the difficulty, they all spoke at once, and the din was indescribable. Above the noise could be heard a frantic cry of distress. A carpet snake was endeavoring to swallow a porcupine. The bristles had stuck in his throat, and a kookaburra, who had a firm grip of his tail, was making an effort to fly away with him. Close by, two bandicoots were fighting over the possession of a sweet root, but, while they were busily engaged in scratching each other, a possum stole it. They then forgot their quarrel and chased the possum, who escaped danger by climbing a tree and swinging from a branch by his tail. In this peculiar position he ate the root at his leisure, much to the disgust of the bandicoots below. After peace and quiet had been restored, the question of the drought was again considered. A big eel, who lived in a deep water hole in the river, suggested that he should be given an opportunity of making the frog laugh. Many of the animals laughed at the idea, but, in despair, they agreed to give him a trial. The eel then began to wriggle in front of the frog. At first he wriggled slowly, then faster and faster until his head and tail met. Then he slowed down and wriggled like a snake with the shivers. After a few minutes, he changed his position, and flopped about like a well-bitten grub on an ant bed. The frog opened his sleepy eyes, his big body quivered, his face relaxed, and, at last, he burst into a laugh that sounded like rolling thunder. The water poured from his mouth in a flood. It filled the deepest rivers and covered the land. Only the highest mountain peaks were visible, like islands in the sea. The pelican-who was a blackfellow at this time -sailed from island to island in a great canoe and rescued any blackfellow he saw. At last he came to an island on which there were many people. In their midst he saw a beautiful woman, and fell in love with her. He rescued all the men on this island until the woman alone remained. Every time he made a journey she would ask him to take her with the men, but he would reply: "There are many in the canoe. I will carry you next time." He did this several times, and at last the woman guessed that he was going to take her to his camp. She then determined to escape from the pelican. While he was away, she wrapped a log in her possum rug, and placed it near the gunyah; then, as the flood was subsiding, she escaped to the bush. When he returned, he called to her, but, receiving no answer, he walked over to the possum rug and touched it with his foot. It, however, did not move. He then tore the rug away from what he supposed was a woman, but, when he found a log, he was very angry, and resolved to be revenged. He painted himself with white clay, and set out to look for the other blackfellows, with the intention of killing them. But the first pelican he met was so frightened by his strange appearance, that it struck him with a club and killed him. 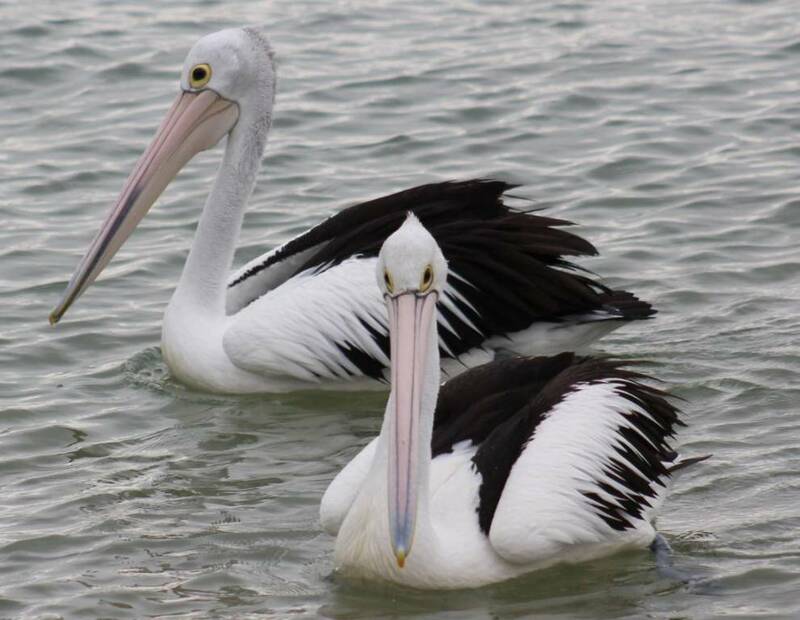 Since that time pelicans have been black and white in remembrance of the Great Flood. The flood gradually subsided, and the land was again clothed in the green garments of Spring. Through the tall green reeds the voice of the night wind whispered soft music to the river. And, when the dawn came from the eastern sky, the birds sang a song of welcome to the new flood-a flood of golden sunlight. This is a collection of Australian Aborigine folklore, addressed to a general audience. The tales and folklore are recounted factually, but the book reflects the time in which it was written, so the reader should take that into account. The author was apparently involved with providing aid to Aboriginal people, according to a relation of Mr. Thomas. Thomas also wrote The Welsh Fairy Book. Photos by A J Guesdon, 2011 - 2013.